The purpose of this book is clearly stated in the title and is intended to be used by trombonists and new violists. The book consists of 14 etudes designed to help players develop genuine reading skills in the alto clef. Each etude presents melodies using only a limited set of pitches to help the musician to learn to read quickly. The first etude uses only five pitches in the middle of the alto clef staff. Each subsequent etude adds pitches while also taking the player through various key signatures and increasing tonal and chromatic complexity, concluding with a highly chromatic and visually-complex alto clef “test.” The rhythms are deliberately basic and the melodies are mostly conjunct to allow the musician to focus on clef reading rather than technical challenges. 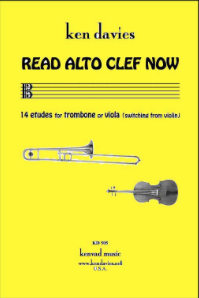 The range of the pitches is from c to b-flat1, which is appropriate for a stronger, developing trombone player that would find him/herself in need of alto clef ability. The author gives brief guidelines and strategies to most effectively learn the clef, recommending that the student avoid what he calls “visual translating” of the notes to a more familiar clef rather than learning to actually read in alto clef. While the book is similar to the previously published Reginald Fink alto clef training method, it provides a new, updated, and somewhat simpler resource for the musician needing to become fluent in alto clef. This book is a simple yet valuable resource to developing musicians finding the need for greater fluency.